Last year, Help At Your Door made more than 42,000 personal interactions with our clients. While visiting the homes of the seniors we serve, we often receive snippets of their lives – growing families, memorable adventures, and celebrated milestones captured and shared in pictures and stories. Some are inspiring, others are cautionary tales, and there are those that make us grateful for the sacrifices made on our behalf. 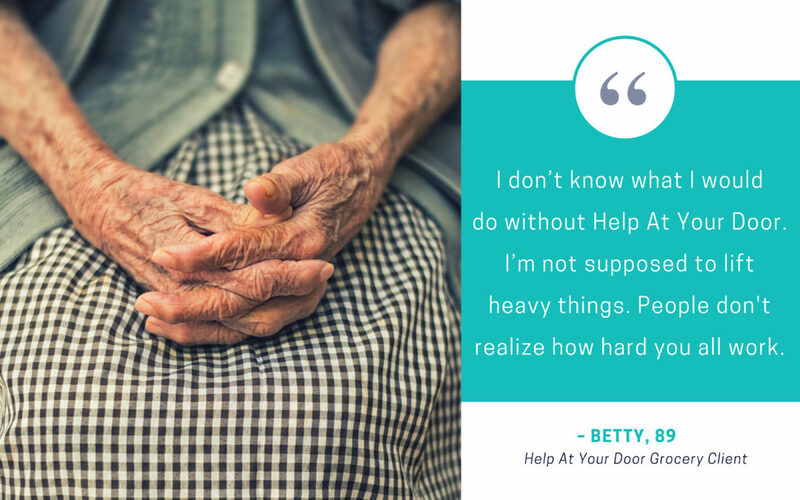 Below is a glimpse into the life of one of our grocery clients, Betty. On the surface her upbringing may seem unbearable, but some of Betty’s happiest memories occurred when times were tough, and resources were limited. In particular, she remembers Christmas and how wonderful it was to have everyone together, enjoying the holiday. It was also at Christmas that Betty received her first doll, created from cotton, tree limbs, and her mother’s love, making her feel like the “luckiest person in the world” despite living in poverty. Betty’s father passed away in 1941 when she was 37, bringing about a whirlwind of change. Her brother went to fight for our country in the war. Her mother and the rest of her siblings moved away from the family home. And it was at that time Betty went to live with her aunt in California to help take care of her niece and nephew. She sent all her earnings from nannying to her mother and the children. While in California, Betty met her first husband. At the age of 18, she got married and moved to his home state of Minnesota. They had a son, John, and stayed together through his graduation from high school. When John left to fight in the Vietnam War (a sacrifice that ended up impacting his health later in life), Betty moved forward with her life a single woman. Betty’s work ethic and resourcefulness enabled her to secure a job at the first Radisson Hotel, located in Minneapolis. She started at the hotel as a waitress and moved her way up to a hostess. It was there, after vowing to never be reliant on a man, that she met her second husband, Craig, a sales manager for Johnson and Johnson. She loved Craig fiercely. Their adventures took them across the county – to New Jersey (where she learned to play golf) and then back to California, finally landing in Michigan with the plan to start an engineering business. But that did not come to fruition. The costs associated with startup ate up their nest egg and Craig fell ill and passed away. Two months after she lost Craig, Betty’s other rock – her son—died, turning her reality upside down and making her feel like there was nothing left to live for in the world. And boy did she work! It was not until Betty reached the ripe age of 84 that she retired and was able to financially support herself – though she needed a little extra help when it came to receiving groceries. A hard life can be made wonderful with an optimistic outlook – and occasionally a friendly, helping hand along the way. If you or a loved one is in need of a help with groceries like Betty, please call 651-642-1892 or Request a Service online. Last year, Help At Your Door made more than 42,000 personal interactions with our clients. While visiting the homes of the seniors we serve, we often receive snippets of their lives – growing families, memorable adventures, and celebrated milestones captured and shared in pictures and stories. Some are inspiring, others are cautionary tales, and there are those that make us grateful for the sacrifices made on our behalf. Below is a glimpse into the life of one of our transportation clients, Mary. As a retired, critical-care, registered nurse who spent twenty-four years working within the State of Minnesota’s Department of Human Services in the Aging and Adult Services Division, Mary knows a thing or two about the services and support that is available to seniors. In fact, she was part of the discussion of how to best help individuals age in place and assisted with the development of a repository of resources for seniors across the state known as the Senior LinkAge Line®. Due to a recent surgery, Mary needed regular rides to her physical therapy appointments. Usually her brother would driver her, but sometimes he had prior commitments that conflicted with the appointments. Together, Mary and her brother searched for other resources. Her brother suggested, “Just call Uber,” but Mary did not feel comfortable with that option. As luck would have it, her driver had previously worked for the Department of Human Services at the same time as Mary did. They knew the structure of the department and other people that worked there, making conversation easy and enjoyable. 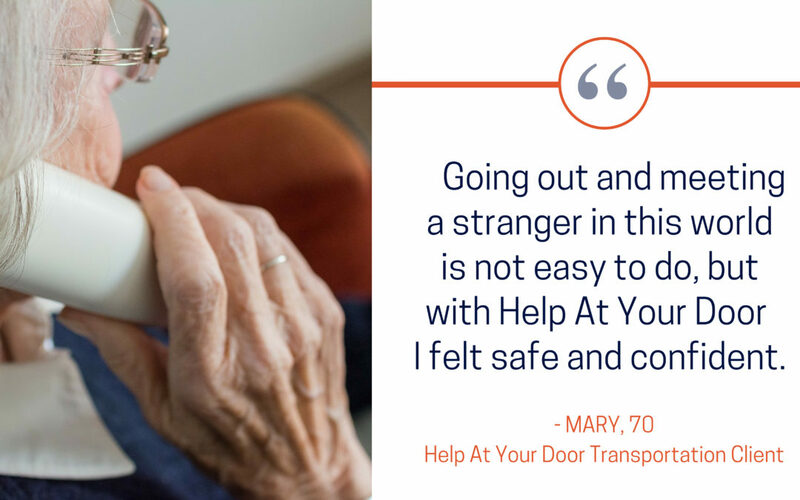 If you or a loved one is in need of a secure and reliable transportation like Mary was, please call 651-642-1892 or Request a Service online. Last year, Help At Your Door made more than 42,000 personal interactions with our clients. When visiting the homes of the seniors we serve, we often receive snippets of their lives – growing families, memorable adventures, and celebrated milestones captured and shared in pictures and stories. Some are inspiring, others are cautionary tales, and there are those which make us grateful for the sacrifices made on our behalf. 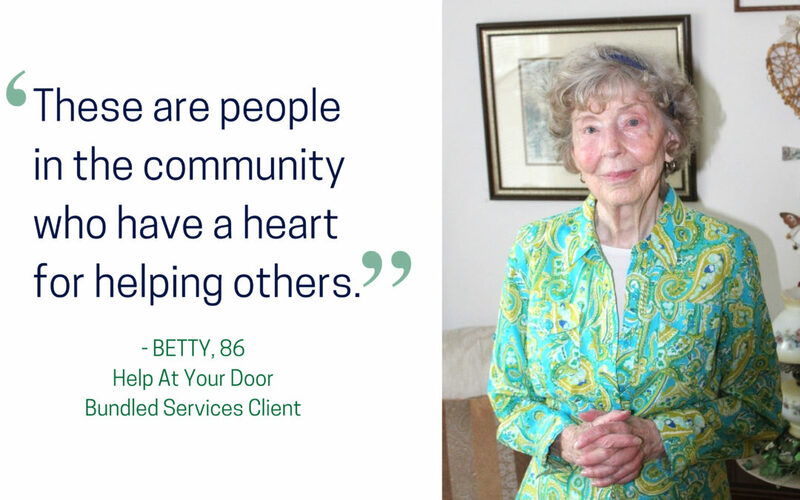 Below is a glimpse into the life of one of our bundled services’ clients, Betty. From serving as a director of the clerical support staff at the Hennepin County Mental Health Service Center to running the New Hope Center for Women, Betty’s journey is one of reflection and determination to move forward, regardless of setbacks. Whether that be nursing her husband back to health after three strokes or navigating unfamiliar communities, Betty tends to make the best of whatever hand she is dealt. Over the years, Betty has also stepped up many times as a caregiver for family, even if it meant flying across the county, including taking care of her sister and helping her niece power through nursing school with little ones. She’s most grateful though of her marriage with Ralph and to this day, still loves to dance – especially the polka. Beginning in 1974, National Volunteer Week (occurring April 15-21, 2018) is an annual opportunity to recognize the contributions of volunteers and the impact that their efforts have on communities across the country. And there is much to celebrate in the Twin Cities, which currently ranks first among the 51 major metropolitans throughout the United States as having the highest share of its residents volunteering (37% — according to the Corporation for National and Community Service). Over 500 volunteers find purpose in giving back to their communities through Help At Your Door. From giving rides and painting projects to shopping for groceries, Help At Your Door’s volunteers step up every day to help seniors and individuals with disabilities maintain their independence and continue living in their homes. We at Help At Your Door realize the awesome impact that our volunteers have. With their support, we are able to make thousands of meaningful connections each year to ensure that those who have given to us are not forgotten. We are so grateful for their continued support. Simply put – we could not do what we do without their help. During National Volunteer Week, Help At Your Door will be recognizing the work of our wonderful volunteers with a series of activities including daily prize drawings and treats at the stores and office. We will also be featuring a number of our supporters through social media via the #ivolunteer because campaign, which gives our volunteers a chance to share why they donate their time to Help At Your Door. Are you interested in making a positive impact in your community? Volunteering at a place like Help At Your Door not only fosters a sense of community – it can also provide direct benefits to the volunteer. Along with helping individuals who need services, donating your time strengthens communities and provides holistic growth for the volunteer. Studies come to the same conclusions: those who volunteer are happier and healthier than those who do not, and volunteering leads to friendlier communities whose members are invested in each other’s lives. 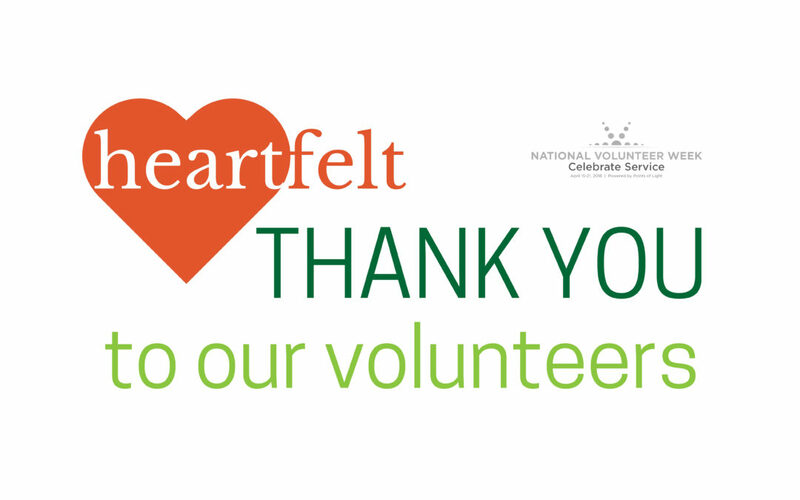 We at Help At Your Door want to wish a special thank you to all of our volunteers who make our community so special. Your work and commitment to our mission and our clients is so appreciated. Help At Your Door knows that with aging comes experience and insight. Visits to the homes of our clients give us the opportunity to hear first hand the stories, laughs, and snippets of wisdom that are acquired over the years. And we would like to share some of those memorable moments with you. Jennifer has not owned a car in decades and enjoyed walking everywhere. She is in her late seventies now and slowed significantly by chronic disease. Combine that with a third-floor condo that lacks an elevator (but offers a beautiful view overlooking a park), she spends a decent amount of time by herself. “In my fifties I realized a long-term relationship just wasn’t going to happen. So I’ve had a life filled with a few close friends, but no one special person. And that’s been its own kind of wonderful. But what’s really served me well these last years is that I love reading and listening to jazz. Those have turned out to be really good habits for someone with a lot of alone time. I can enjoy them both, right here in my living room. I’ve grown into a person I can live with—someone I actually enjoy spending time with—and for me, that’s pretty priceless. Sarah has lived in her home for 65 years—just as long as she’s been married to Ron. A lot has changed over those 65 years, most especially over the past ten years as Ron’s Alzheimer’s has progressed. Carol’s gentle demeanor suggests otherwise, but she credits her life to anger (plus some terrific doctors). Soon after losing her brother to cancer she was diagnosed herself. Her sisters figured Carol was “good as gone” because she “just wasn’t a fighter.” But after five bouts of cancer, a lost kidney, and a heart attack, she’s still here. 2017 was a year of change for Help At Your Door. Committed to meeting the diverse needs of our clients, their families, and caregivers, we expanded our services. In addition to bringing food to those in need, we now offer Home Support and Transportation, all of which help people continue their lifelong routines and stay connected to their communities. I would like to thank all of our clients, caretakers, volunteers, staff and donors. It is a privilege to interact daily with people who care deeply about the independence of seniors and people with disabilities. Being independent does not mean doing everything yourself. Knowing when to ask for help is often the key to preventing injury and improving quality of life. Many older adults need only a small amount of support to remain healthy and in their homes – and our services are helping people do just that. With the number of older adults expected to grow significantly in the coming years, it is essential that Minnesotans have the support to embrace aging. In the year ahead, we will continue our efforts, giving those that we serve the peace of mind that comes with using our trusted, experienced services. Thank you for your investment in our organization. We could not do what we do without you.